The writing is often introspective, but intelligent and open; everyone has had different crises, panics, rewrites, rejections and doubts: though all of them have ultimately succeeded. Each section ends with words of wisdom for writers. There are so many good ideas in this: read at the level at which you want to write; bypass publishers, put it out yourself; adopt an international viewpoint; push for original ways of describing things; pick ordinary moments and magnify them. David Baldacci’s description of the profession is delightful: ‘I’m paid to daydream.’ Basically, I could spend this entire review quoting line after line from this book because it is all crafted by such accomplished writers. Armistead Maupin warmly remembers an encouraging teacher; Susan Orleans considers the awkwardness of calling oneself an ‘artist’. Almost every word in it feels like it is in its right place. That said, I did skip the Jane Smiley chapter – I was made to write one too many essays on A Thousand Acres and I’m keeping a promise I made to my teenage self that I needn’t read her again. Many of the pieces have strong similarities, so it is more a book to dip into than to read all at once. There is a good mix of common issues, idiosyncrasies and practical concerns. 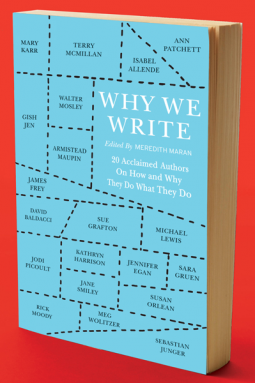 The writers answer the question of why they write with brilliant honesty (from ‘the money’ to ‘I can’t think what else I’d do’) though one idea seems to pervade for the majority: something in them knows that they must write. They simply have no choice. So, now I’m curious: why do you write? Comments please! It’s an interesting book for writers and others interested in the craft. It’s also a worthwhile purchase: part of the profits goes to 826 National, a youth literacy organisation. Thanks to NetGalley for the review copy.